Flexibility in business has become of equal in importance with operational efficiency. Service-oriented architecture (SOA) can help businesses respond more quickly and cost-effectively to the changing market conditions by promoting reuse and interconnection of existing IT assets rather than time-consuming and costly reinvention. SOA has been the top fashionable topic in IT for a few years now, which is because there is a consensus of opinions among enterprise architects that SOA is the key to making the IT department a catalyst for growth and innovation. DB2® for z/OS® integrates with Web services, acts as a service provider, and lets SQL applications consume Web services. DB2 customers can make their heritage DB2 applications easily available in a service-oriented architecture and by supporting native XML data types. Using DB2 you can build new applications and exploit the strategic characteristics that XML provides. 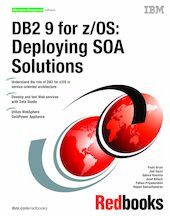 In this IBM® Redbooks® publication, we help you to get started with SOA by showing the implementation of the minimum requirements: Creating Web services that allow access to data that is stored in data servers or applications and the realization of interaction services for business to consumer integration. We implement these requirements using functions that DB2 for z/OS provides, such as pureXML™ and SOAP UDFs, in conjunction with the functions that Data Studio, DataPower® , and WebSphere® Application Server provide.